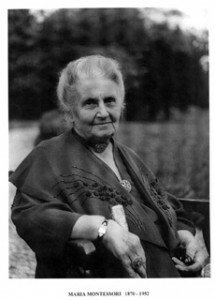 Dr. Maria Montessori was born in 1870 in the province of Ancona, Italy. Among her many accomplishments she became the first woman physician in Italy’s history at the age of 26. She is best known, however, for developing the educational method that bears her name. Montessori worked tirelessly to advance the cause of child education throughout her career, first in Italy where the first Montessori school was opened in Rome in 1907, and later in India and finally the Netherlands where she founded the Association Montessori Internationale. Montessori identified prevalent characteristics and tendencies that appear during each stage of a child’s development. She further recognised that educators must develop keen observation skills so that the needs of children can be met as they express themselves. Montessori devised materials and activities that are presented to children as their developmental needs arise, allowing children to satisfy those needs independently. The universality of her method has been proven over and over again in thousands of Montessori schools spread over six continents. Maria Montessori was also a great advocate for world peace- in fact she was twice nominated for the Nobel Peace Prize. She envisioned a peaceful and dynamic world where all growth- be it physical, emotional, social, mental or spiritual- could proceed if children were provided with the opportunity to flourish as self-directed, caring and independent citizens.